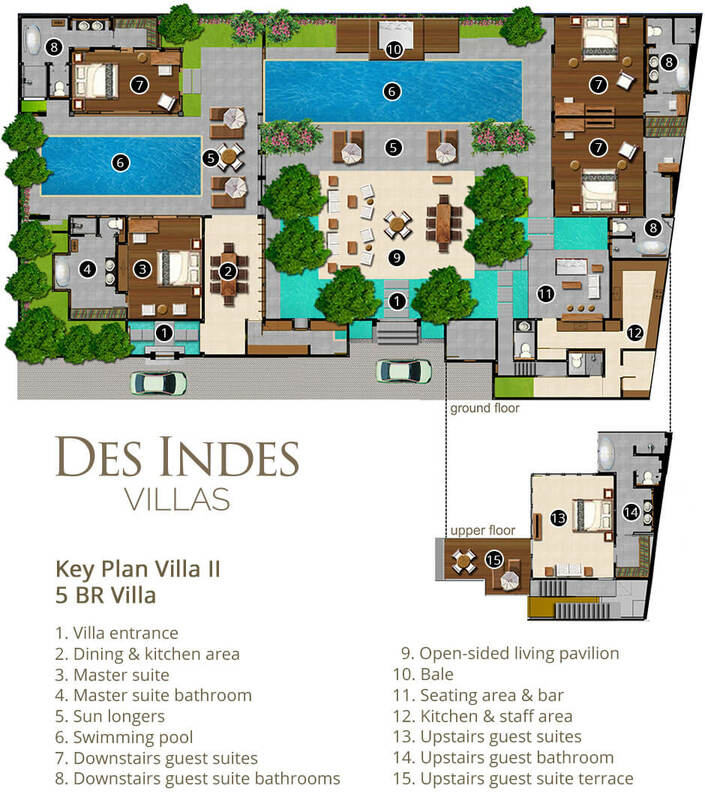 Accommodation at Des Indes Villa II is in five pavilions arranged around two swimming pools. The social heart of the villa is the huge open-sided living pavilion surrounded by a koi pond and facing a large balé across the main pool. Set into one corner is a two-storey building with seating area, bar, kitchen and guest washroom downstairs and, above, a bedroom suite with a private terrace. Next to this is a sleeping pavilion with two large bedroom suites opening onto the pool terrace. To the other side of the main living pavilion is a second sitting area, a small alfresco dining area and two further bedroom pavilions, which face each other across the second pool. A wall of plantation shutters allows these two bedrooms and the second pool to be discreetly closed off from the rest of the villa if extra privacy is sought. The huge fan-cooled open-sided living pavilion – its soaring teak-lined roof supported on massive wood pillars – is the villa’s social hub. Opening onto the swimming pool and surrounded on three sides by koi ponds dotted with islands of heliconia blooms, this is Bali-style living at its best. Old-style cane sofas and planters chairs are arranged around coffee tables in two distinct seating areas, and ten guests may gather around the teak dining table in cushioned comfort. Across the koi pond is a bar area with antique style seating and, behind the service bar, a very well-equipped kitchen with sophisticated coffee maker and wine fridge. On the other side of the main pool, facing a sun terrace fringed with sun-loungers, is a large cushion-covered bale. A second fan-cooled living area, richly decorated with antique Indonesian furniture, faces the villa’s smaller swimming pool. Des Indes Villa II’s five bedrooms are spacious and handsomely designed, with teakwood-lined vaulted ceilings, custom-designed display cabinets, and polished wood floors embellished with oriental rugs. Four feature a king-size four-poster beds swathed in mosquito netting, while twin beds (that convert to a king if preferred) rest under a towering mosquito net in the fifth bedroom. The colonial-style furniture and striking art and artefacts provide a rich visual counterpoint to the ultra-modern 47-inch curved TVs with satellite channels and DVD players. The upstairs bedroom has its own roof terrace, two ground floor bedrooms open onto the main pool terrace, and two face each other across the second pool. All five feature fans and air-conditioning as well as a beautifully decorated air-conditioned marble bathroom with dressing area, bathtub, twin basins, and walk-in shower enclosure. The Laksmana Estate, Seminyak, Bali, Indonesia. 10 adults (5 bedrooms: 4 with king-size bed, 1 with twin convertible to king); extra beds may be set up on request (additional charge applies). Large fan-cooled open-sided living pavilion with two seating areas and dining table for 10; poolside balé with comfortable cushions; bar terrace with seating; well-equipped kitchen; second living area and dining pergola alongside the smaller pool. Main pool: 16m x 4m. 0.8m-1.7m depth; Secondary pool: 10m x 3m. 0.5m-1.6m depth. Villa manager; assistant manager; chef; cook; butlers/housekeeping; garden and pool staff; maintenance; security (night-time only at villa, 24-hour for estate). Additional staff (babysitters, masseuses) available on request. Breakfast is complimentary; priced menu of Western, Asian, vegetarian and children’s dishes for lunch and dinner; requests accommodated (including special diets). Fibre-optic internet with WiFi; landline for local calls (international calls charged); mobile phone coverage; PABX system with connections in all rooms; printer and fax (on request). 47-inch curved TV with satellite channels in four bedroom; 43-inch TV in one bedroom; DVD players in all bedrooms; amplified and Bose speakers in living pavilion; books and magazines. Des Indes II makes a great villa choice for families. Equipment at the villa includes a baby cot and high chair. Many other items (including booster seat, baby bath and pool fence) can be supplied on request for a small additional charge. In-villa treatments selected from a comprehensive spa menu can be carried out by visiting spa therapists (extra cost applies). The villa’s central Seminyak location means many attractions are within easy walking distance. If transport is required, the villa manager will happily call one of the island’s safe and reasonably priced metered taxis, or organise the hire of a car and driver. Barbecue; back-up generator; safety deposit boxes; 2 massage beds. 1,080 sqm (land); 515 sqm (build).